This school year, we are studying the background to the Civil War through the 1990’s. We do 1 hr. of writing and 1 hr. 15 mins. of history every other week with a group of about 12 students who are between 5th and 8th grade. Between co-op times, we work on our own. The students are using the Modern History Portfolios, the Modern History Portfolio Teacher’s Guide, and the Houghton Mifflin text book, A More Perfect Union. In addition, in co-op and at home, I read aloud from various high quality living books, plus read from Story of the World whenever possible. I also provide printed handouts of short encyclopedia articles for additional research materials. The plan is for students to complete one double page spread of the History Portfolio per co-op day, with about 1 hour of homework expected before the next class. This is what we did that first day of co-op. Our lecture and discussion for this initial series of five classes aimed to shed light on how it was that our country came to the point of Civil War. What were the roots of the problems that brought us to war? We talked about the beginnings of a two party system, and early rifts between the North and the South. 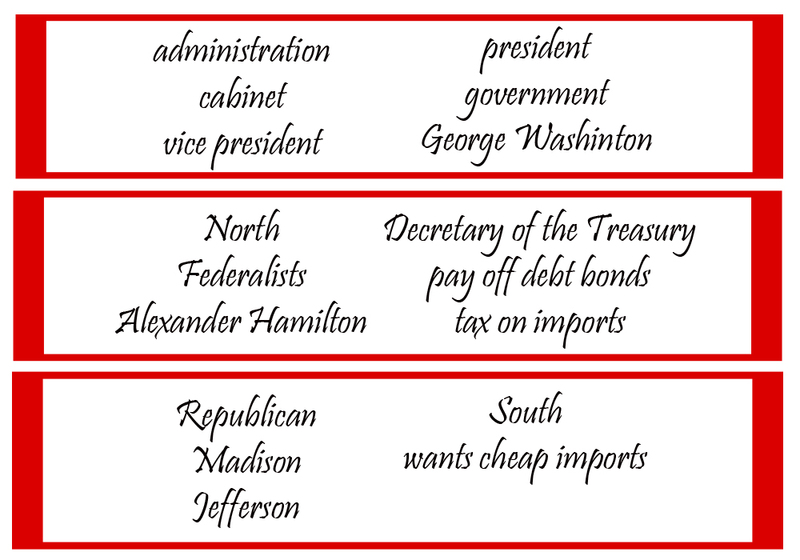 I underscored the fact that our first three presidents were in office from 1789-1809; that in this period there was already the clear beginning of a two party system; and that approx. 60 years later, we were embroiled in a Civil War. -A detailed discussion of bonds: why were they issued or sold, discovering who would have been the original bond holder, why the original bond may have sold their bonds for a small percentage of their possible later worth; AND What kind of person may have been in the position to purchase bonds from the original bond holder (the students were able to provide the answer that poor people would have sold them, wealthier people, taking a gamble that the bonds would be worth something later, were in a position to buy). -Sec. of the Treasury Alexander Hamilton’s plan to pay off the debt after the Am. Rev. bonds, and that more speculators lived up in the manufacturing north. -Why did the south not favor a tax on imported goods? I showed a map of Virginia which detailed the rivers that penetrated deep into the state. British ships, laden with manufactured goods, conveniently delivered everything southerners needed. Southerners, who depended upon imports, did not want a tax on imports. The north favored a tax on imports because it made American produced goods less expensive and therefore more desirable to Americans. If Americans bought more American made goods, that would be good for the north. -Secretary of State Thomas Jefferson was a southerner, disagreed with Hamilton, and sided with James Madison. -Jefferson and Madison began calling their party the Republicans, also known at the Jeffersonian Republicans, or the Democratic Republicans. After the reading, and the discussion, the students provided me with keywords. They called out one word, or a phrase at a time, and I wrote them down as they called them out. As discussed in a previous post, providing keywords rather than complete sentences is much less intimidating. Everyone can get involved in this part. 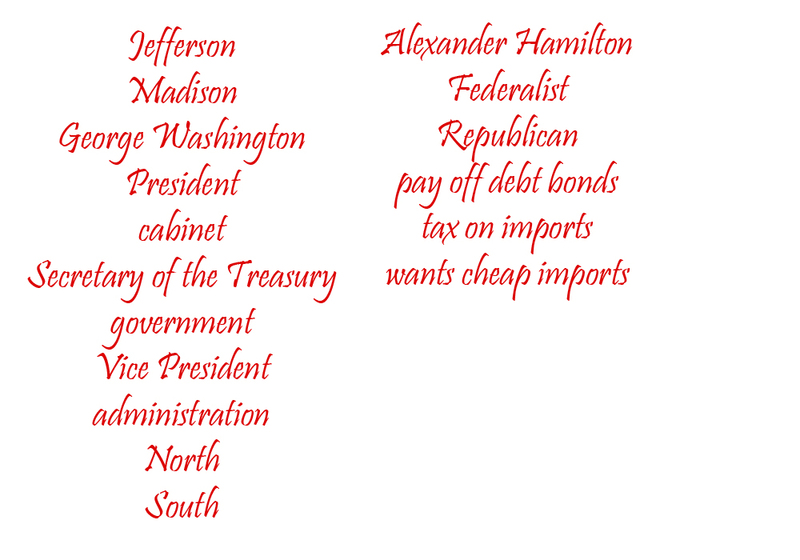 A running list of keywords provided by the students. As a group, we then sorted these words into topics. *Since this was the first class of the year, I introduced the idea of sorting into topics by giving my “laundry basket and dresser drawers” example. On the dry erase, I drew three rectangles and we sorted the keywords into them as if sorting clothes out of a laundry basket. So, in the following picture, I show the topics sorted into something like three dresser drawers. Keywords sorted into three topics. They decided on the outline in the photo, and were able to confirm that each collection focused on a single topic. Since this was the first class of the year, we didn’t rank the details into A,B, C, D. Also, we just didn’t have time even if I had planned to. There will be plenty of time to work on that later. This outline was pasted into a large text box within the chapter “A New Nation.” Each week, if not expressly assigned, I challenge each student to work on the off week to turn any outlines into full reports, and to paste both the outline and the report into the Portfolio. Each week, as we work on pages in the Portfolio, we also add all images and complete any additional written activities indicated in the History Portfolio Teacher’s Guide.